The Academic Skills Series has won the award for Innovation in Learner Resources at the British Council ELTons 2014! Everyone here at Collins is absolutely delighted about the wonderful news. 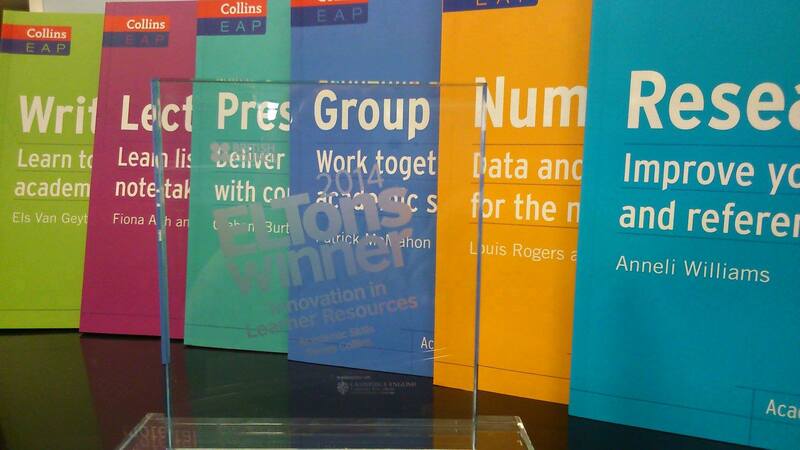 The ELTons trophy looks just fabulous on the shelves in the Collins offices, doesn’t it? ELT Publishing Director Catherine Whitaker and Publishing Manager Celia Wigley accepted the award trophy at the British Council ceremony on Thursday, 23 May 2014. They thanked the eight fabulous authors and the wonderfully dedicated Collins ELT team. You can watch the award ceremony online (the acceptance speech is at 1 hour 25 minutes). This entry was posted in News on May 23, 2014 by admin.